Awesome 3br/3ba Beach Colony West Unit, Views of Entire Island and Direct Beach Front! Awesome condo with spacious layout on this East end unit. Making this a perfect place for coming together with friends and family to enjoy the unique panoramic views of the Santa Rosa Sound, the Gulf of Mexico, and the Island of Navarre Beach. Navarre Beach has perfect, clean, sparkling white sand, emerald green waters and the best fishing pier in Florida! The owners of this unit have put your comfort as their highest priority. The unit has been newly furnished and tastefully decorated, and is in pristine condition. The condo includes many special amenities such as whole unit water filtration, high end furniture including a desk and king size bed with luxury pillow top mattress in the master bedroom. The balcony has expensive and strong balcony furniture, plenty of seating to appreciate the gulf front view, and take in a sunset or two. The unit also includes custom made light blocking drapes (huge upgrade) and shutters, and has a fully equipped kitchen featuring a KitchenAid mixer and large butcher's block cutting board. 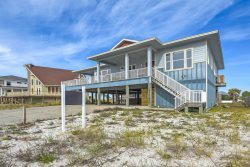 You will not be disappointed when securing this beautiful condo for your vacation and you will love the beauty of Navarre Beach. Beautifully decorated large rooms, gorgeous views from multiple balconies, beach chairs and toys available and right on the beach with a large pool. I couldnt have asked for a more perfect fit for my families needs.